For hundreds of years it's been common knowledge that a dog is a man's best friend. But that relationship may be in danger judging by the bond between this pet and an orphaned baby elephant. 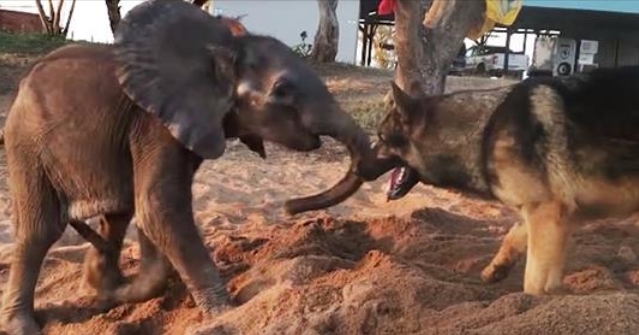 The African bull calf, named Ellie, was rejected by his herd and was then adopted by the Thula Thula Rhino Orphanage in South Africa, where his budding friendship with resident dog Duma is helping him get back on his feet. Their playful antics have been captured in a video uploaded to YouTube which has revealed even more tragedy behind Ellie's young life. Speaking to Earth Touch News, Karen Trendler, a rehabilitation and crisis response expert, said the elephant's interactions with Duma were key to his development. She said: 'What was a really interesting thing was the elephant calf was particularly weak and particularly ill. He was not showing much interest in doing anything; he was lethargic and distracted. Ellie was abandoned by his herd for unknown reasons and the centre made several attempts to reunite them to no avail. Ms Trendler said when they found Ellie he had an abscess on his belly button area which meant it was effectively open. Responses to "Dog Helps Sad Baby Elephant Find Will to Live "
Hope he makes it and Duma is not too disappointed when he leaves. Must be put into a juvenile group of males to learn what to do and become a great bull.